Hi everyone! How are you all doing? I’ve been really busy with cake and treat orders this week but I knew I had to get this kebab recipe out there so you guys can try for yourself how easy and delicious this really is! I will be the first to say that I am not a big fan of ground turkey; I am a ground beef kind of girl but this was super good. So, even if you aren’t the biggest fan of turkey; try it! Also, try my turkey meatloaf recipe; that would win you over too! 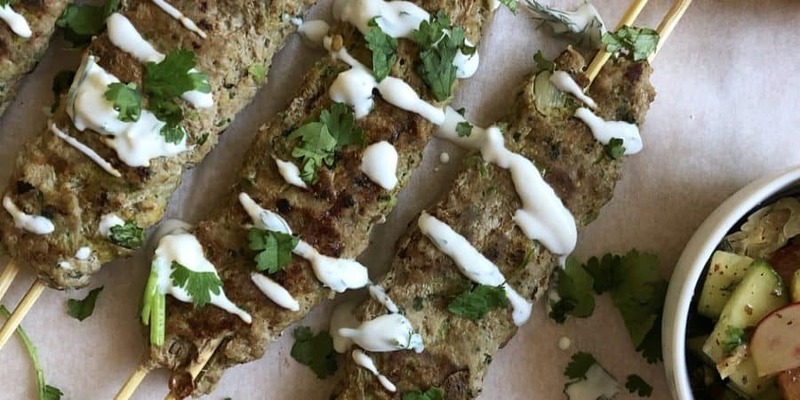 There are plenty of spices and veggies that go into this kebab so you can only imagine how flavorful and moist it will be. Total Time: 10-15 min to put together and cook. Marinate for 6 hours. In a food processor, blend the bell pepper, onion, garlic, and cilantro. In a bowl, add the ground turkey and all the spices above along with the blended veggie mixture. Mix well all together. Let this marinate over night or for at least 6 hours. Place wooden skewers into water for 15 minutes. This is a tip my mom taught me when making kebabs. Then add the meat to the wooden skewers using your hand. If you don’t want to use a skewer, you don’t have to! You can make the mixture in any shape you like even burgers! Grill for about 6-8 minutes till fully cooked. If using a George Foreman grill like I did, then make sure to oil it well so the meat doesn’t stick. 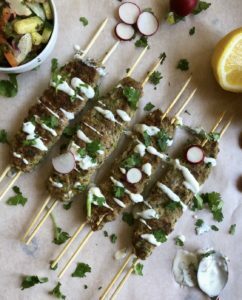 Enjoy your kebabs with some refreshing tzatziki sauce drizzled on top and a squeeze of lemon! Also, very delicious with a side of fattoush salad. Forget the carbs for dinner this time!